BENDER & GRITZ, APLC is a San Diego law firm that exclusively handles personal injury, wrongful death and worker's compensation cases. Our reputation is founded upon the outstanding results we have achieved and our personal commitment to our clients. Our practice has been built on referrals from past clients and other attorneys that recognize our skill, dedication and unique experience representing people who have been injured. 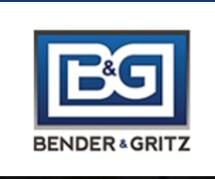 The attorneys at BENDER & GRITZ, APLC have a wealth of experience in handling your injury case. At BENDER & GRITZ we provide our clients the benefits of solid dedicated legal representation by a staff of aggressive, ethical and experienced attorneys. We are one of the very few firms in San Diego that handle both personal injury and worker's compensation cases and we can navigate these two very different areas of law efficiently and effectively to maximize your financial recovery. The insurance companies and large corporations have attorneys on their side and you need strong legal representation to fight them. We have represented thousands of clients and have obtained multi million dollar awards for our injured clients. We never take an attorney fee unless we prevail on your behalf. Call us today to speak to an attorney and set up a free consultation.